Agincourt was platted in 1853, shortly after the formation of Fennimore county, and incorporated as a city four years later. The county seat (and presumably the site of the first county fairs) was at Muskrat City, south of Agincourt. But the flatland site and regular flooding there forced the commission to relocate to Agincourt. Such maneouvers are often more political than strategic, but that’s a tale for another day. County agricultural societies often incorporated in tandem with county formation as agents for information, promotion and economic development. Like the county courthouse, the fairgrounds was a valuable asset for the city that possessed it. Since courthouse and fairgrounds aren’t always in the same city, Agincourt has been fortunate. So, as a point of departure, let’s set the process in motion, identify the site and pose some relevant questions. The Fennimore county Agricultural Society is roughly contemporary with the establishment of Agincourt, circa 1853. The fair site in the northeast quarter of the section adjacent to Agincourt measured slightly more than 100 acres on the west bank of the Muskrat river. The wiggle of the Agincourt Road right-of-way was also a minor factor. A trade was negotiated with the adjacent farm, that had likewise been cut apart. The resulting triangular fairgrounds extends seven-eighths of a mile west of the Muskrat and slightly less than a quarter mile along its bank. It is likely that the original fair entrance had been near the Agincourt Road bridge (at the fairgrounds’ southeast corner) but was relocated to the north side along Highway #7 with the advent of the automobile. Some sort of county or state institution was established across the Muskrat in far northwestern Agincourt (the purple area on the map above). Unspecified at first (perhaps an orphanage, home for the aged or for Civil War veterans), it morphed about WWI into a normal school or state teacher training college. It seems likely the college athletic facilities expanded across the river onto fair property as shared resources. Since fair activities are often restricted to the late summer harvest season, what efforts were made to extend its “season” and expand its use for the community. A chautauqua grounds would be a compatible function. When the electric street railway opened circa 1898, it would have been natural to establish a seasonal line to the fairgrounds for passengers, as well as a route for occasional deliveries by rail. And finally, the Agincourt Archers is a Double-A baseball team. Would their playing field have been on the fairgrounds? County fairs are a distincly American phenomenon, with a wide variety of types depening on location and age. I wonder what the interweb has to offer. The most memorable classroom presentation I ever witnessed was at UC-Berkeley in the spring of 1980. Notice I didn’t say “lecture.” That word can be off-putting. I sat in on J.B. Jackson’s class on the American landscape. Jackson had invented the academic field of cultural landscape studies and was surely one of the most charismatic and effective teachers in the history of education. I’m told Vincent Scully at Yale was Jackson’s match. The amphitheater might have held 200, but slightly less than half the seats were occupied that morning. Jackson spoke from stage right, near a laboratory table, and thralled us for about forty-five minutes without slides or any other illustration. Only at the end, the lecture safely concluded, did he append a half dozen grainy slides taken from a moving vehicle in a dust storm. But the immediacy of those frozen moments only reinforced what we had just heard. His words had conjured better images than a Kodak carousel would have feebly cast on any available flat surface. Jackson’s topic that morning? The county fair. I think of it today as a friend reveals he has taken on the design of Fennimore county’s fairgrounds. The country fair–contrasted with city fetes and festivals–was a place to display our prowess in horticulture and husbandry. But, more important than blue ribbons and bragging rights, it was a marketplace for improved crops and livestock. Seed was traded and sold. Male animals were put to stud; females sold to the highest bidder. Knowledge, too, passed among the crowd: tips on planting, erosion and pest control. The result was a mixed blessing. The gene pool did indeed improve, but at the cost of biodiversity–a lesson we are learning at our peril in the 21st century. The country fair was a social event as well. Paths crossed that otherwise would not. Conventional wisdom grew in volume and assurance. And human breeding stock improved along with cattle and sheep. In a pre-industrial society, the availability of mates was often limited to the social island of the farmstead and, at best, the parish church and village. Families intermarried in a complex genetic tartan plaid of ever tightening weave. So the dance and other social events enabled marriageable youth to improve their prospects and their progeny. This was as true for medieval England as it was in 19th century Agincourt. I never met Hal Holt but by all accounts he mentored some of Agincourt’s most eccentric citizens. An engineer by training and practice, Holt was a right-brained engineer, a “poet-plumber” more inclined toward the big picture than to formulas and safety factors. Perhaps that’s why he retired from the profession and devoted his life to history. 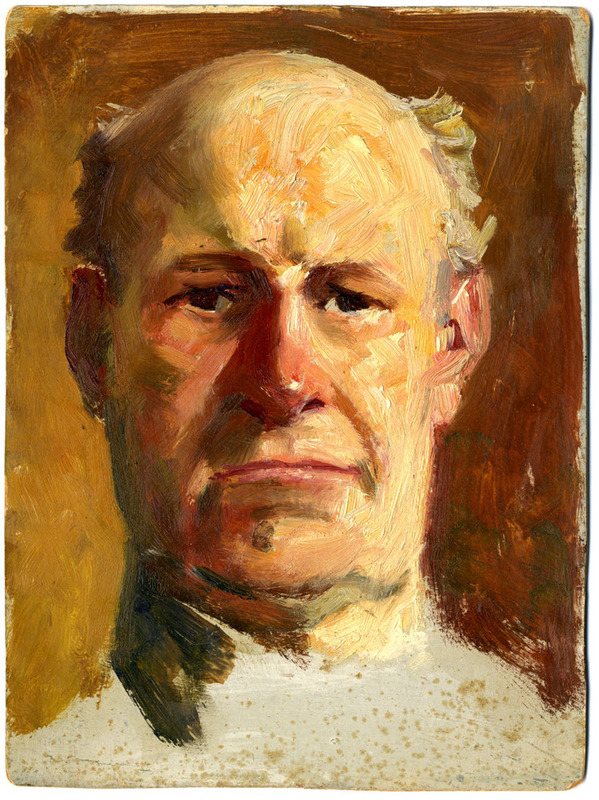 Howard wrote about Holt’s death in 2008, a paean to Holt-the-Historian, crotchety keeper of local lore and grandson of Malcolm Holt, founder of the county historical society. So it was natural that Holt would have known Abel Kane and, moreover, that he would have mid-wifed an introduction for Howard Tabor. Harold Holt had been born in 1920, Kane in 1933, and Tabor in 1945, an interesting generational spread for that shifting conversation on a Saturday afternoon circa 1972. But Holt never said very much about Kane, I suspect, because it would have seemed an invasion of privacy, not to mention an evasion of his personal code of conduct as an historian. And by the way, we haven’t heard the last word from Hal. Tottering-on-the-Brink was what every classroom should be: an open environment for unfettered exploration. I relished the two or three times a month we gathered for dinner and conversation—i.e., communion. Until last week, however, I had never read Plato’s Symposium (embarrassed to admit that), but now I understand. A typical gathering at the Brink? Each of them and none were typical. I recall one that began with John Kirkpatrick’s pioneer recording of the Ives’ Second Sonata (the one called “Concord”), so multi-layered and poly-rhythmic that no other performer would risk it. (There are now, more than thirty years later, a half dozen fine interpretations. Times change; skills improve. We stand on the shoulders of our elders.) That notion of a work so technically challenging suggested a verbal parallel in The Magic of America, architect Marion Mahoney Griffin’s autobiography, itself multi-layered, poly-valent and comparably intimidating of interpretation. Leaps like that were common. All authors I might not otherwise have met. My experience with teachers is simple: the better among them never stopped being students. And a large number of those never knew they were teaching in the first place. Such was Abel Kane. Abel Kane died July 5th, achieving his own independence. At his request I am executing Kane’s Last Will and Testament, which states in brief what he wanted most and modestly: 1) to have done little harm; 2) to have left a family of friends; 3) to have taught more by example than by words. Harold Holt gave order to the history of Agincourt, Fennimore County and the Muskrat River Valley, the fourth generation of his family to fill that community role—whether the community wanted it or not. The practice of history is about discovery and interpretation, the telling of a community’s tale. Now and then, it is also about editing; some things are better left alone, unsaid. That category includes Abel Kane’s origins, which Hal Holt took to the grave. Howard would be too modest to tell you about his immediate family–his father, for example. So let me say a few words about Warren Tabor, who died in 1995. Warren James Tabor [1917-1995] managed the local power company; a progressive sort who involved the corporation in various community projects. In 1990, for example (five years before he died), Tabor negotiated purchase of the old interurban depot as the power company headquarters and an important step in downtown revitalization. Yet he was a skittish, shy man who avoided photographers and any sort of limelight. So imagine Tabor, wife, and friends on a hot evening at the Fennimore County Fair circa 1980. How did they get him to hold still long enough for an unrecorded artist to do this quick portrait sketch? Measuring about nine by six inches, this was sketched on a thick piece of cardboard in about twenty minutes. Having your portrait done is creepy, as the painter, friends and passers-by stop to stare at the artistic progress; the subject remains ignorant of what’s going on until the work is nearly complete. 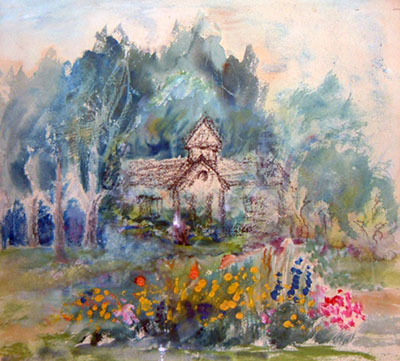 Tabor must not have liked it, because the painting remained hidden at home until after his death. Only then did it find its way into the Memorial Gallery in the old public library building, where it has hung discretely for the past fifteen years. Warren wouldn’t approve. If you’d like to see this and other works in the Memorial Gallery collection, about forty pieces will be shown in the next Agincourt exhibit—Homecoming/Coming Home—in October 2012. Or if you just can’t wait until then, pester me and I’ll let you have a peak. By the way, Howard doesn’t look a lot like his dad, favoring the Tennant side of the family instead. 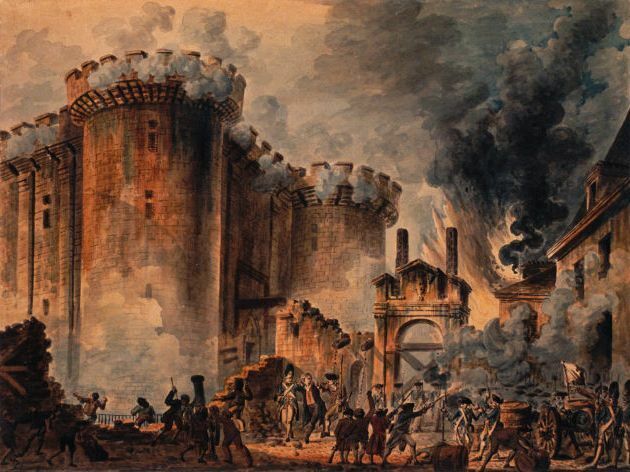 Today is Bastille Day, celebrating the storming of the notorious Parisian jail on July 14th, 1789, and the beginning of the French Revolution. For a few years after that, it commemorated the fall of one tyranny and its replacement with another. Revolution, of necessity, had to become Revelation. Let’s hope for better luck for the Egyptians, Tunisians and others presently engaged in a similar process. So, today, find someone French and give them a long deep kiss. Oh, this is also the birthday of my friend James verDoorn. You can kiss him or not, as you see fit.